Cook the udon noodles as directed on the package. Bring the dashi and mushrooms to a boil and simmer for a few minutes and turn off the heat. Mix the miso into a ladle full of the dashi and then pour it back into the dashi. 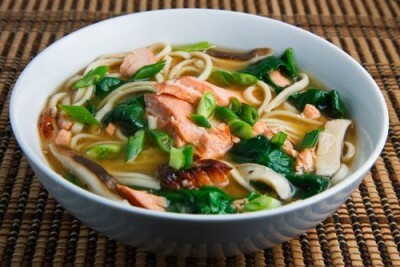 Divide the noodles, salmon and spinach between 2 bowl and pour the broth in. Garnish with the green onions.